Blanchester senior wrestlers Clayton Schirmer, Steven Latchford and Ramiro Torres. Ramiro Torres admits it’ll be a “big shock” to walk into St. John Arena Sunday morning for the Division III State Team Duals tournament. “It’s my first time being in a big arena,” the Blanchester High School senior wrestler said. But much like the basketball coach that uses a tape measure prior to the big game to show his team the basket is 10 feet high just like their own gym, BHS coach Scott Nicely says it’s just a match. “These guys put their singlets on, their shoes on just like we do,” he said. Blanchester will meet Rootstown in the quarterfinal round of the State Team Duals at 11 a.m. Sunday on the Ohio State campus. The winner advances to the semifinal round later Sunday afternoon. The finals are set for 7:30 p.m. Sunday. 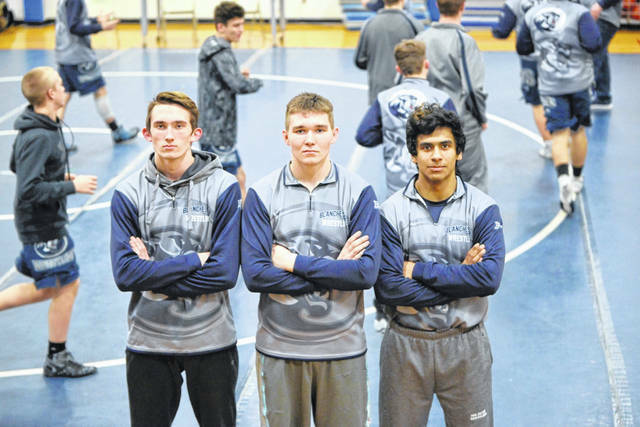 While both Rootstown and Blanchester are making a third appearance in the State Team Duals, the Rovers are loaded with projected state qualifiers. Caleb Edwards at 113 pounds and Chris Langguth at 182 pounds are both projected state champions. Ryan Boyle at 220 pounds is a projected state runnerup. Edwards was third in the state last season while Langguth was fourth and Boyle seventh. Blanchester’s highest ranked wrestler is James Peters, who is projected fifth at 220 pounds. Clayton Schirmer is projected eighth at 152. Rootstown advanced to Sunday’s Elite Eight with a 53-21 win over Waynedale last weekend. Blanchester defeated Bethel-Tate 58-15 in its regional final match. Both teams are young with underclassmen throughout the lineup. Torres, Schirmer and Steven Latchford are the only three seniors in the BHS lineup. At the beginning of the season, the Wildcats were talented but youthful. “I knew this was definitely something we could accomplish,” Schirmer said. Rallying behind their senior leadership, the Wildcats grew up fast on the mat and made things look easy in the Region 23 tournament. “They work hard when they need to work hard but the like to cut up,” Nicely said. Nicely feels Schirmer, Torres and Latchford all lead in different ways. “Clayton is THE leader,” the BHS coach said. “When something needs to get done, somebody needs to get checked, that’s Clayton. “Torres makes sure guys are doing what they’re supposed to be doing. Which is plenty. Latchford goes to school in the morning for a few hours, then heads to a Honda dealership where he works as a tech before going to wrestling practice. After practice, he’s off to McDonald’s to wrap up his night. “I like to stay busy,” Latchford said, noting the money’s not a bad incentive either. St. John Arena complicates the whole “it’s another match” theory more than most venues. The crowd is right on top of the wrestlers and Nicely admits some can get “awestruck” when they walk out of the tunnel and look up. Ultimately, though, it’s still one wrestler versus another on a mat much like the one back home.